Over the past year, I have sat simultaneously on the OWA Steering Committee and on the AIA EB Board of Directors, as the Associate Director, after verifying that neither group found it to be a conflict of interest. However, I felt conflicted being privy to each group's "inner workings". I dealt with this by overcompensating and sharing nothing about one with the other. Additionally, I was stretched thin serving both and had difficulty committing fully to either in the process. All AIA Board of Directors posts are of a two-year duration and the OWA Steering Committee's tenure is for one or two years. I was contemplating how to juggle both and once the two-year tenures were completed, what to do. I have stayed on six months past the yearlong tenure, while looking for a replacement, continuing to co-edit the newsletter with Mui Ho and attending Steering Committee meetings. Happily, Carolyne Orazi agreed to take over my post which includes being editor of the OWA newsletter, a task which can take several hours to a couple of days to complete, if none of the members submit articles. If you have anything you would like to write about, please go onto the OWA website and submit your article to the editor and help lighten Carolyne's load. As I have heard said by many people from the time that I volunteered with the Steering Committee, the reason the post runs for one or two years is so that members do not get overworked and burnt out volunteering, as well as to let other people get the chance to volunteer. As is encouraged, many members come back and rejoin the Steering Committee after being away for some time. I want to take a moment to thank everyone for such a wonderful experience working with the Steering Committee, attending OWA retreats and presentations, sharing dinners and great conversations and, through the OWA, getting to know some of the most accomplished, supportive, generous, intelligent and kind women that I have ever met. It has been a great experience and opportunity for growth and I plan on remaining active with the OWA. Currently, I am organizing this year's panel discussion which Hafela has, once again, generously agreed to host. The panel's topic is "Women in Green: Voices of Sustainable Design" and it is named after the book of that title by Kira Gould and Lance Hosey. Please look for it on the OWA calendar, and I look forward to seeing you there on August 18. Although my living on the peninsula keeps me from attending meetings, much as I want to, the newsletters and annual retreat at Westerbeke keep me feeling still part of the OWA group, which is a very good thing. The OWA was founded at a time when there were few women architects, and almost no work. The old boy network was not one that included us, so the new girl network we formed ourselves was an effective answer. I got my first three jobs in the Bay Area through OWA contacts. As times got better, the group focus expanded beyond employment networking into sharing different approaches to coordinating our personal and professional lives, as well as exploring many areas of professional development. As a group we were diverse before it was fashionable, creative, intelligent, often well dressed and very funny. We still are. We were generous in sharing our knowledge and experience, mentoring each other long before it, too, was fashionable. That spirit is the heart of OWA.. Now I am one of the old girls, looking at today with great concern. As we appear to be heading into a recession worse than I have seen in my 30 years of practice (and it was pretty bad in the 70's), I am glad the OWA community remains, as it was then, a source of mutual support and strength for whatever is coming next. Flurries of snow lightly fall while the sun peeks in and out of the clouds. Enjoying my hot spiced cider in a ski pub, I reminisce about my first OWA steering committee meeting at Pat McGowan's home. My former professor, Mui Ho, told me to just "check it out since it would be a great way to meet people." After a tasty home cooked meal and dynamic conversations, I immediately joined the committee. Over the years, serving in two rounds of steering committees, I not only developed meaningful friendships with my fellow committee members, but also have gotten to know many OWA members--what a great group of smart, supportive women with common as well as varying interests. Most memorable to me was the 30th Anniversary Retreat. Friday night's Show and Tell theme was to share our experiences in life and career, and how we arrived at where we are now. I learned about what many women of the older generation had to go through after they graduated from college. It never occurred to me that way back when, women were told that women just didn't become architects. What a strange concept to me, considering that I was told that I could become anything when I grow up. If it were not for these strong, courageous ladies who paved the way in the design professions, then our current generation would not have had the abundant opportunities to accomplish and enjoy what we do today. So, thank you to all the OWA members for setting the standards and inspiring us. With a walk down memory lane, I can't believe that I've been a member for more than 10 years! How time flies by quickly as one gets older-yikes! That said, OWA will soon be celebrating its 40th anniversary. It's time to get cracking on planning the events--is everyone ready to party? I am presenting a training course on disabled accessibility to meet California State licensing requirements for continuing education on disabled access on April 4, 2009. If you would like to attend, please send a deposit to me by March 15 to guarantee your place. The total cost for members is $100.00 and for non-members, $125.00. The course is titled Disabled Access: Continuing Education Course. 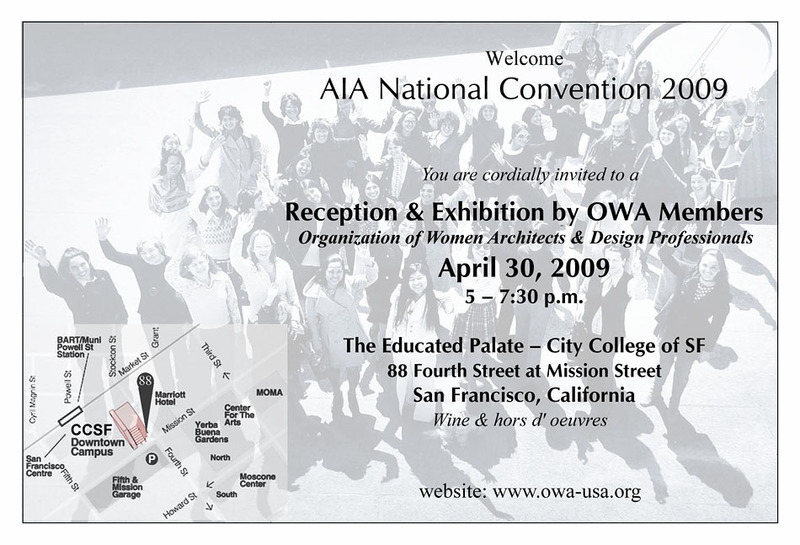 The OWA Steering Committee and Event Committee would like to host a no fee reception on Thursday, 30 April from 5:30- 7:30 pm during the AIA National Convention in San Francisco for OWA members and their guests. 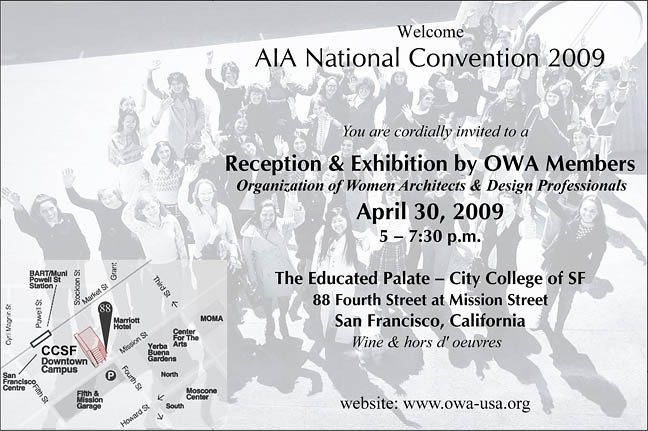 We think it would be an excellent opportunity for the OWA members meet other woman and other architects from 50 states and to exhibit their work and expose OWA to the architectural community. We have a chance to show not only the history of our organization but, also the immense effect women have had on the architecture throughout the world. Inge Horton has graciously offered to lend us her historic pictures and posters of OWA and of Women in Architecture for this event. This is a great opportunity for all of us to demonstrate to the terrific work we are doing in San Francisco, the Bay Area, and beyond. Additionally, this is another occasion to socialize with OWA members yet, also meet new people in the architecture and design community. The reception would be held at the Educated Palate Restaurant at the San Francisco City College Downtown Campus, 88 Fourth Street at Mission Street. The students from the Culinary Arts Program of City College will create a terrific menu of hors d'oeuvers using an architectural theme. The reception room will have 20-30 easels showcasing the work of our members on a 30" x 30" board mounted to 3/16â€� black foam core. Those interested in submitting exhibition boards, can email their interest in advance to djang@barcelonjang.com to hold an easel and place for their exhibit board. For the 30 x 30 board, please place your name or the firms (if applicable) at the bottom right hand corner of the board along with address and/or website. Deliver your board in protective paper wrap to the office of Barcelon & Jang, 315 Bay Street, 3 Floor, San Francisco, CA 94133. Call 415-834-0248 if you need other arrangements. Deadline for receiving boards shall be on or before April 24, 2009, 6 pm. The fee for submitting boards will be $15.00/board. For those submitting boards as well as other members are also welcomed to display their work on a PowerPoint presentation that will flash on a screen in the restaurant during the reception. Email or submit a CD with digital jpeg images 300 dpi, limit 4 images per member. The fee for the PowerPoint presentation is $10.00/project. The College has offered to keep the board exhibit for the duration of the AIA Convention so others passing by will have a chance to view member's work. We would like to solicit as many members as possible to submit work in either format for this reception. AIA National Convention is approaching quickly and the members of the OWA have a unique opportunity to showcase their work and publicize the success of our organization. Please come and share in this event. As many of you know I am working on a project to build a biofuel refinery in the Bayview District of San Francisco. Since the last OWA Retreat I have rethought the design. The project is now called a Green Transport Fueling Hub. There will be car chargers and electric bus chargers, self tours of the plant operations, snack bar and a deck with those exercise bikes that produce energy as you ride. The plant will process up to 40,000 gallons of waste cooking oil a month into biodiesel fuel. The biodiesel will be blended for different marine shipping and trucking fleets per their needs. Each Green Hub will be designed as a Roadside Attraction. The one in San Francisco will be inspired by the Richmond power plant with lights, exposed metal. The lights will be powered by solar panels, on top of awnings. To tell you the truth, the design is very schematic now. Next step is a model to sort it out. By the time you read this, goddess willing, the project will be filed with the SF Planning Department. My goal with this project is to increase prosperity in the Bayview Hunter's Point by reducing carbon emissions, creating new jobs and helping stabilize a corner of Bay Shore Blvd. The corner of Bay Shore and Oakdale, up a concrete thrown path is a crack dealer's paradise. The hardest thing for me is to believe in my project and manifest it. There are many plutocratic and political maneuvers to be made, piles of forms for grants and oversight departments that issue permits to build and operate. Carolyne Orazi volunteered at the Christmas Party 2008 to help me organize and even fill out the dreaded paperwork. She has been absolutely a dream and shows up each week for 3 hours to help me. I don't think I would have gotten this far without her help. Friends of the Urban Forest will be planting two trees early in April. I have completed planting climbing, scented pink roses on the existing chain link fence. I will notify OWA by email when I have the exact date. Please come. This newsletter goes out to an extremely experienced and talented group of Women Architects and Designers. If anyone is interested in joining the Green Hub Manifest Expedition, please feel free to contact me and come visit my office for coffee. Did I remember to say thank you to OWA? You helped me lick my wounds from my divorce and estrangement and get moving again in this crazy world. Candice Hyde-Wang's fascinating and timely presentation of Real Estate by Design: Design Your Sale, Design Your Purchase, Architect in Real Estate was graciously hosted at the office of Muller and Caulfield Architects in February and was well-attended. Candice, an architect trained in real estate and cognitive psychology, described how she (entered the field of real estate and) started her business, Real Estate By Design in 1992, when the recession brought new construction to a standstill, and how she has devised a formula to maximize a house's selling price. Through her real estate work, Candice found that most people do not invest money into selling their home, while her background in architecture and psychology informed her on what upgrades to invest in to boost its appeal and selling price. The tax code allows a single owner to live in a home for two years and then sell it and make up to a quarter of a million dollars profit, or half a million for a couple, free of capital gains tax which (coupled with the architect's design sense) makes investing in real estate a good fit for architects. Candice stressed, too, that most often a house does not need a full remodel or renovation in order to attract a buyer, but that focusing one's investment on the kitchen and bathroom is the most effective strategy. Refinishing wood floors, painting and "strengthening the architectural style"� is also key to maximizing both sale-ability and return on the investment - for instance, replacing added seventies style details to a charming, older home with ones that are more period-appropriate. This strategy works as people counterbalance the pros and cons of the place. One values what one sees and one uses the kitchen and bathroom daily; but if there is a roof that was patched recently and might leak during the next rainy season, Candice found that more likely than not there will be a buyer.